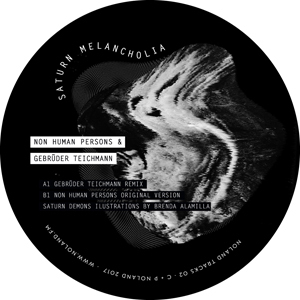 Non Human Persons´ Saturn Melancholia is an early song of the polish band based on guitar & voice + processor, recorded in Warsaw some years ago. With their remix Gebrüder Teichmann turned the song into a sacral techno anthem. A deep and dark trip with Nico in the heart and MDMA in the blood. The B-Side features the Original Track plus a beautiful hand carved image by Brenda Alamilla.